If you're like me, your skin probably freaks out during seasonal changes. *sees person raise hand* And, you all know how I feel about taking care of your skin - I talk about it here. These two products worked wonders during the Winter and have been amazing transitioning into Spring. Algenist Complete Eye Renewal ($68): I actually came across this brand through my mom. During one of our trips, I forgot my eye cream and she had a sample of the Algenist Ultimate Anti-Aging Eye Cream on her. I normally look into what I'm putting on my skin before trying it, but this looked legit. Later on, I went to Sephora and really liked what I read about my current eye cream. 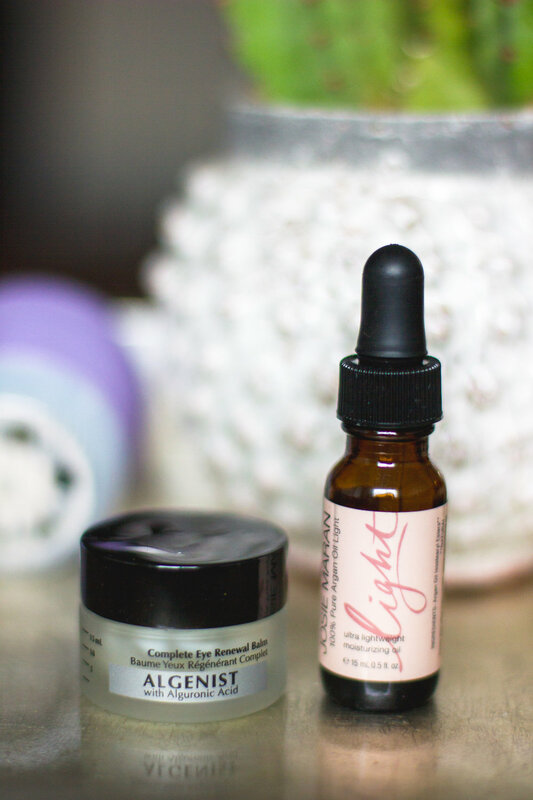 I chose the Eye Renewal Balm because it suited my needs and age. My undereye area isn't dry but I like to take care of it with hydrating stuff. This eye cream feels hydrating without the oily feeling. It doesn't feel like a thick layer of butter. It also helps prime your eye makeup and we all know that area needs to be super smooth for the concealer. If you want to go read about Algenist, you can find out all the deets but basically they use a different alguronic acid from other skin care lines. Tip: I find that when I pat the cream on it makes me look more awake. Josie Maran 100% Pure Argan Oil Light - Mini ($16): I get these really random flakes on my nose. I get oily in my t-zone but my skin likes to peel for whatever reason. This oil has been amazing! I was skeptical to try an oil because I prefer a matte, dewy face. However, the light version really seeps into your skin but totally hydrates. Like, I haven't had flakes on my nose since I bought it. I have the mini and only use it about 2-3 times a week. A little goes a long way and since I'm not terribly dry I don't need a glob. I also love that it makes me feel luxurious when I apply it. Tip: Put dots on your face and then pat it into your skin. Thank you for reading! Let me know if you've tried any of these. If you try them later, come back and let me know.